Axelrod, Journalist Discuss Election, Post-Election "Hellscape"
David Axelrod in conversation with John Heilemann, co-managing editor of Bloomberg Politics. David Axelrod met with John Heilemann, co-managing editor of Bloomberg Politics, at Saieh Hall on Monday, in the latest of his Decoding 2016 series of guest talks. 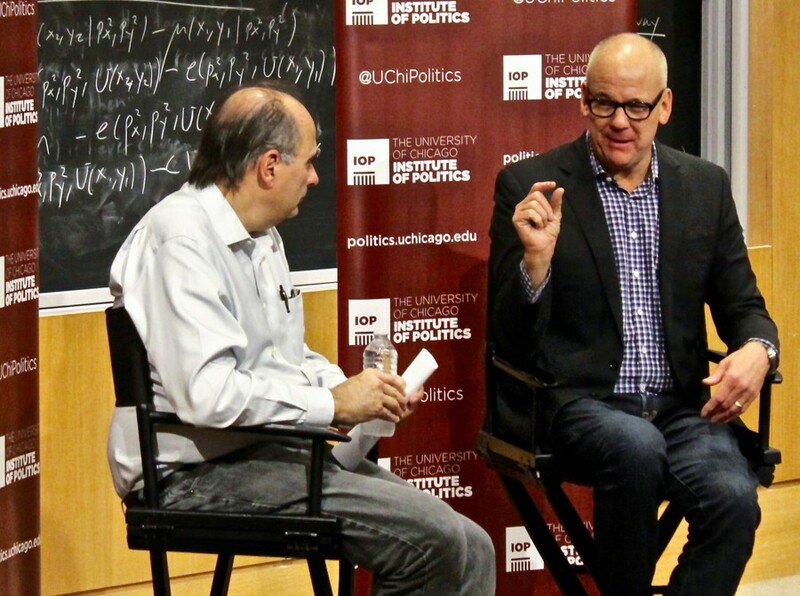 Heilemann also covers U.S. politics for New York magazine, and is a frequent contributor on MSNBC. “A huge terrorist 9/11 scale event on U.S. soil, I don’t know what that does to the political dynamics. A piece of WikiLeaks e-mail that in a clear way found Hillary Clinton guilty of some criminal conduct. Hillary Clinton collapses on stage in the third debate. Those things could change the electoral dynamics,” Heilemann said. Axelrod asked Heilemann to speak to the economic conditions that have given rise to Trump. Axelrod looked around the lecture hall. “How many are entitled and happy?” he asked. Most students raised their hands. As Trump has slipped in the polls, he has ramped up his claims that the election will be rigged against him. Heilemann thinks Trump may be positioning himself for a post-election business opportunity. “25 million people who are virulently anti-Clinton and believe the election was stolen, that’s a pretty good market opportunity—if you want to start a radio network, a television network, a website, if you want to become the new farther right rival to Fox News, you want to team up with Steve Bannon, who’s now running your campaign, call it Breitbart-Trump network,” Heilemann said. As the pair discussed the future of what Heilemann called a “deeply fractured” Republican party, they emphasized the importance of Clinton’s margin of victory. “I think there’s a reasonable chance the Republican Party won’t exist six years from now, if it’s a really close outcome in November,” Heilemann said. If Clinton wins narrowly, “Trump will say three things. One, the election was stolen at the ballot box. Two, the media was stacked against me. And three, the Republican establishment fucked me. With Paul Ryan and the rest of those Republicans, we would have carried it… He will exacerbate that, and will drive towards a civil war within the party,” Heilemann said. Axelrod doubts House Speaker Paul Ryan’s capacity to garner support and lead an increasingly reactionary caucus. “To do things, he’s gonna have to work with Democrats, and to work with Democrats is a firing offense for many people in that caucus,” Axelrod said. Heilemann hopes for a Democrat-controlled Senate but wants to see Paul Ryan lead a slim Republican majority in the House, without which he doesn’t think Ryan will be able to corral Republican support for any bipartisan measures. “If Republicans are out of power in both the Senate and the House, their attitude will be fully nihilistic. Their attitude will be, just make Hillary Clinton’s first two years a bitter hellscape,” Heilemann said. Dowd spoke with Axelrod and New York Times journalist Carl Hulse.